Disney's the Little Mermaid live-action remake director Rob Marshall reacts to Lindsay Lohan casting rumors. Lohan has gotten in on the fun and wants to star in the remake alongside Meryl Streep after fans suggested that she would be perfect to play Ariel. The actress declares that the under the sea tale is her favorite movie and that she is harassing her agent about getting in touch with Disney. Details surrounding the upcoming remake are sparse and it doesn't look like the casting process has even started at this time, though it was heavily rumored for a while that Zendaya was the actress that the studio wanted. In a new interview, The Little Mermaid director Rob Marshall was asked about Lindsay Lohan potentially getting the lead role of Ariel in the live-action remake. While things don't seem to be going in Lohan's favor at the moment, there is still a chance that she and her agent can work some magic to get the part. But, that will be up to the studio to decide. Rob Marshall had this to say. "Gosh, I don't know who's gonna play these roles yet. We haven't really got that far. I think we'll start that process probably sometimes this summer. You know, right now we're just focusing on the characters, the material, which is everything. You know, that's the most important thing. I'm starting have some ideas. But it's, you know, haven't gotten there yet." 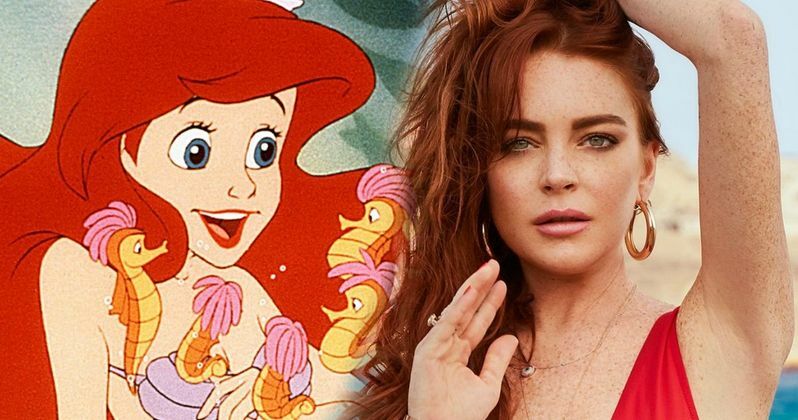 Reactions on social media to Lindsay Lohan's pleas to play in Ariel Disney's live-action remake of The Little Mermaid have been pretty favorable. The actress certainly has the look down, but it's unclear if she has the acting and singing chops to satisfy Disney. Reactions to Zendaya getting the role have been mixed at best, though it seems that was only a rumor since Rob Marshall says they haven't gotten to the casting phase yet. However, he could just be letting Lohan down gently. Lindsay Lohan is also gunning for a Mean Girls sequel and wants everybody back to reprise their roles from the original. Much like the idea of the actress starring in The Little Mermaid live-action movie, that doesn't look like it's going to happen at this time either. With that being said, Lohan probably has a better chance of getting that Mean Girls sequel than getting the role of Ariel. Rob Marshall also revealed that there will be new songs included in the live-action Little Mermaid movie in addition to the classics from the original. Lin-Manuel Miranda and Alan Menken are writing the new songs that will help tell this new version of the story on the big screen. Marshall looks forward to bringing the iconic tale to life in a new way, but it appears that they are just getting started, which makes sense since Disney is putting out three live-action remakes this year alone. You can watch the interview with Marshall below, thanks to the Entertainment Tonight YouTube channel.